It’s not quite 45 years since The Stalls of Barchester was first broadcast, as it aired on Christmas Eve 1971, but this is close enough and since when have I ever run TMINE’s The Wednesday Play feature on a day other than a Wednesday, hey? Stalls was the first official entry in the annual 1970s BBC play strand, A Ghost Story for Christmas. It was adapted, produced and directed by Lawrence Gordon Clark, who had seen Jonathan Miller’s 1968 adaptation of James’ Whistle and I’ll Come To You and being a lifelong fan of the author, pitched the idea of another adaptation to Paul Fox, the then controller of BBC1. Fox agreed and Clark chose Stalls to be the first in a series he would produce, as well as largely write and direct. The slightly novice and unconfident Clark chose to follow many of Miller’s choices with Stalls, including building up tension and fear through suggestion and atmosphere rather than being overt, and shooting on location (Norwich Cathedral doubles for Barchester) using 16mm film rather than video; he even hired Warning‘s Ambrose Coghill to play the curator. Unlike Miller, however, he was able to shoot in colour – and rather tastefully, too, unlike many video-shot shows of the early 70s. He also reveals a bit more of the supernatural than James ever did in his story and despite a cast of actors known mostly for their roles in sitcoms, avoids the humour that Miller included in his piece. With no fixed run time thanks the scheduled late night time slot, Stalls was able to run to 50 minutes and proved so successful that Clark was able to make an annual return to James’ stories for most of the decade. And it’s your Wednesday Play – enjoy! Making art history programming interesting, accessible and memorable is a tricky thing. Doing two of those isn’t necessarily hard, but all three is tricky. For example, I watched all of Simon Schama’s Power of Art, but while I found it very interesting and accessible, I can’t tell you much about what our Simon said except that Caravaggio was very realistic and good with lighting. For me, it failed in actually educating me about art. 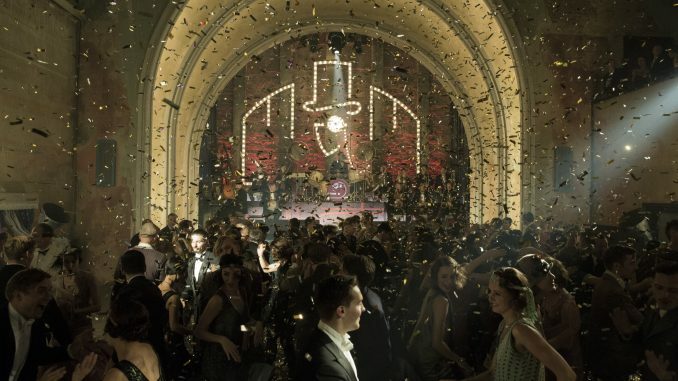 Dramatisation, which was one of Simon’s tactics, can certainly help with making art history interesting and accessible, but there are few arts programmes that have gone as far as Omnibus did in using dramatisation to make it memorable, too. In 1979, the BBC arts programme included an hour-long drama about 17th-century Dutch painter Godfried Schalcken. What was even more novel about it and helped it to be memorable was that rather being a simple biopic, it was also a ghost story. In common with Jonathan Miller’s original adaptation for Omnibus of Whistle and I’ll Come To You, Schalcken The Painter is not officially part of the BBC’s long-running series A Ghost Story for Christmas. Yet not only did the episode air in the series’ traditional slot of 23 December, vacated when the series was cancelled in 1978, it also fit in tonally, while still being an arts programme dedicated to exploring Schalcken’s life and art. Based on Sheridan Le Fanu’s short story Strange Event in the Life of Schalken The Painter (sic) and narrated by Charles Gray as’Lefanu’, the episode follows Schalcken (Jeremy Clyde)’s career from his early days as a pupil of Gerard Dou (Maurice Denham), one of Rembrandt’s most famous pupils. There he falls in love with Dou’s niece Rose (Cheryl Kennedy), but before they can be betrothed, a pale man called Vanderhausen (John Justin) comes to the door, offering a huge sum of money in exchange for her hand in marriage. Rose begs Schalcken to take her away before the marriage goes ahead. Does he? Well, you’ll have to watch to find out. Schalcken the Painter was directed by Leslie Megahey, the producer in charge of Omnibus, who had actually only accepted the job on condition that she could adapt Le Fanu’s short story for the programme. Inspired by Walerian Borowczyk’s Blanche, she shot the film in the style of a docudrama, using the absolute bare minimum of dialogue. To meet the Omnibus remit, many scenes depict Schalcken recruiting models and posing them for his most powerful works, with Gray exploring the merits of each composition and how it might have derived from Schalcken’s life and mental state. 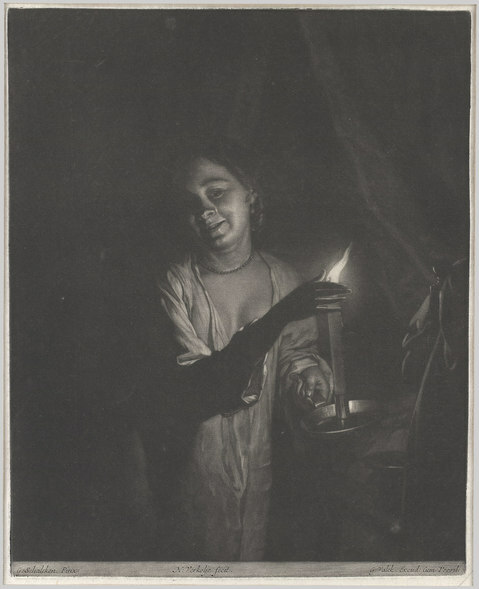 The most important of these, ironically, is a fake – an adaptation by the production team of ‘Young Girl With A Candle’ in the style of Schalcken that starts and finishes the episode and purports to be the inspiration for Gray’s narration. But Schalcken is not the only artist to feature. As well as Dou, Rembrandt (Charles Stewart) himself turns up to commission Schalcken. And the production team used the paintings of Vermeer, de Hooch and Dou to learn what interiors of 17th century Dutch domestic dwellings were like, as well to compose scenes. For the more frightening qualities of the story, they also took inspiration from both Schalcken’s and Rembrandt’s work and their mastery of darkness. As a piece of art history, the fictional nature of the story obviously means Schalcken The Painter is flawed, particularly since its most enduring image isn’t actually by Schalcken. But it’s now probably more famous than Schalcken himself and certainly more people will have heard of him because of it than would otherwise have done. Certainly, I did. Here’s the first few minutes, but if you like it, as always, buy it (iTunes if you prefer)!